I don’t know about you girls, but I love when my outfit can work double duty for me. It is nice if you have a busy day to not have stop home and change (if you are anything like me, you are then tempted to not go back out!). I started with a simple black dress that most of us have in our closets. Mine isn’t anything fancy, just a simple knit dress that I picked up from TJ Maxx over the summer. By simply changing out my accessories from my day to evening outfit, I was able to get two completely different looks out of my dress. 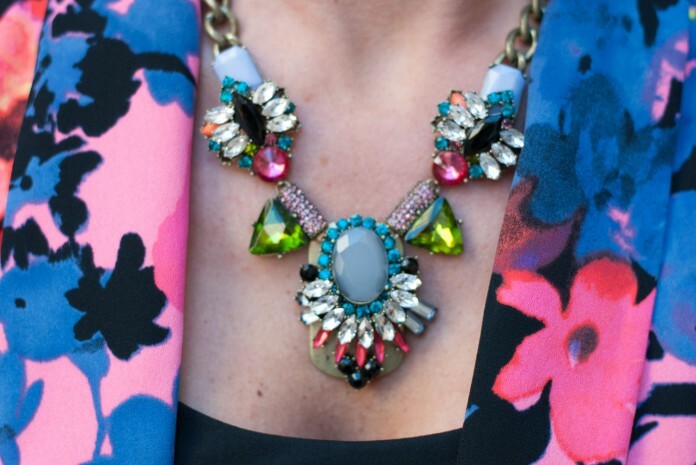 For my day look I paired it with a fun blazer, statement necklace, and cute yet practical low wedges. Since I started with a black dress it gave me endless options to style it. Pick your favorite blazer and some fun jewelry. They become the focal pieces on your day look. For my evening look I was able to use my same necklace. I didn’t want to bring anything more with me than absolutely necessary so I went with a statement necklace in my day look as well. The nice thing about this look is that you are only really changing your accessories. Even though I had a statement necklace and leopard clutch, the dress still stood out more than it did with my day look. I added a pair of patent leather black heels with a black patent leather belt. My night look highlighted more of the nice features of the dress. I am sure that this is not a revolutionary idea to any of you, but I thought I would share one of my double duty looks that I was really happy with the outcome. Sometimes it is the really obvious outfits that I get mundane with. I love when I see another blogger’s post and they have this beautiful, yet simplistic outfit, that reminds me of some items that I have in my closet and have forgotten about and haven’t worn in a while. I love those little “a ha” moments. What are your favorite pieces to use to get you from your day to night look?